The Chinese New Year is the most important of the traditional Chinese holidays. The festival traditionally begins on the first day of the first month in the Chinese calendar and ends with Lantern Festival which is on the 15th day. Chinese New Year’s Eve is known as chú xī (除夕). It literally means “Year-pass Eve,” and is also a festive time just like the New Years Eve we have in the States. This Year, Chinese New Year starts on February 10rd in the US. 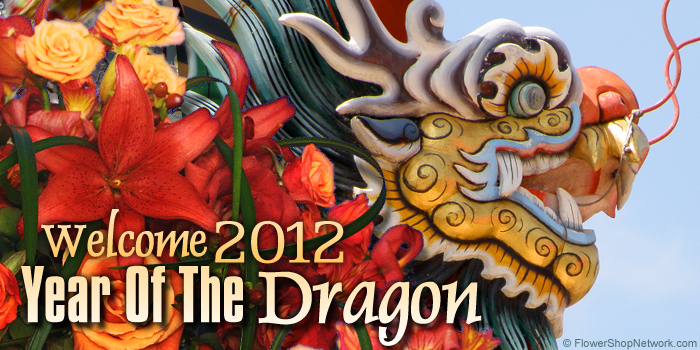 2013 is the year of the snake according to the Chinese Zodiac. If you are throwing a Chinese New Year party, or simply celebrating at home with family, don’t forget the flowers! I know what you’re thinking… flowers for Chinese New Year? Well, yes. Flowers are actually very popular Chinese New Year decorations. Red – an emblem of joy, and this color also symbolizes virtue, truth and sincerity. It is thought to scare away evil spirits and bad fortune. According to tales and legends, the beginning of Chinese New Year started with the fight against a mythical beast called the Nian. Nian would come on the first day of New Year to devour livestock, crops, and even villagers, especially children. One year, people noticed that the Nian was scared away by a little child wearing red. The villagers then understood that the Nian was afraid of the color red. Hence, every time when the Chinese New Year rolled around, the villagers would hang red lanterns and red spring scrolls on windows and doors. Gold – gold is another favorite color of the Chinese New Year. Gold symbolizes fortune and prosperity, perfect symbols for a new year. Plum blossoms are also a favorite, but may be hard to find. In some places in China, plum trees are purchased much like Christmas trees for the Chinese New Year celebration. If you are giving your Chinese New Year flowers as a gift, use the traditional red envelope as their enclosure card. The red envelopes are given out during Chinese New Year and almost always contain money of an even number. (Odd numbers are associated with cash giving during funerals.) The number 8 is considered lucky and most of the red envelopes given in the US contain $8. So remember, if you’re looking for great floral Chinese New Year decorations, contact your florist and custom order something special! Search Flower Shop Network’s florist directory to find a real local florist near you! If you aren’t sure how to custom order a Chinese New Year flower arrangement, send them a link to this article! This post is brought to you by local San Francisco, CA florists. No in Cali? No worries, use Flower Shop Network’s handy directory of real local florists to find a florist near you!